T his is one of my favorite paintings. 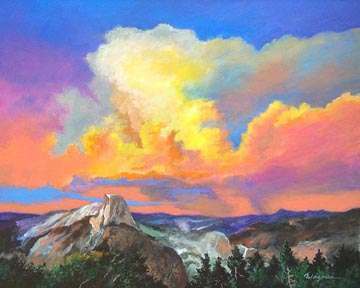 In "Glory of Yosemite" I've tried to portray the sensation of radiant clouds hovering over Half Dome below. Heaven touches earth in this scene from Yosemite National Park. The Master Designer paints both sky and earth with ever-changing patterns from moment to moment as the sun moves in splendor across the open heavens. The source of my inspiration is the Creator Himself. He is the Master Designer! He made the entire universe and all the marvelous creations in it - like clouds, trees, seas and all life. Without Him, our hearts wouldn't even keep beating. In fact, they never would have started to beat. Several years ago I experienced the symptoms of congestive heart failure. The doctor ordered that my heart be monitored on a screen that showed each time a valve opened to let blood flow through. As my heart beat regularly, it was awe-inspiring watching it. It turned out that there was nothing wrong with my heart at that time except for an allergic reaction to niacin. However, I have the joyful assurance that when my heart stops beating, I'll be home with the Lord! My assurance of going to be with God someday is not because I'm so wonderful -- far from it! My heavenly hope is built only on God's great gift of His Son -- our Lord Jesus Christ. He died to save sinners and to wash them from their sins with His own blood! But He didn't stay dead! He rose again from the dead after three days! Forty days later he ascended into heaven and will return to earth again -- perhaps very soon! Are you ready for that great day? Click here to find out how to get ready. Shrouded by darkness and gloom. Light enters my prison drear! Hope rises to still my fear. Bought by Thee -- my soul's true light. Several years ago my husband, Bob, found an old electric guitar in the trash bin of our condominium. He rescued it, took it to a local guitar shop where they put new strings on it and repaired broken parts. We discovered that it had professional tuning pegs on it that were worth around $100. Someone who apparently had played the guitar professionally no longer needed it. The future for the old guitar in that trash bin was not promising. It was bound for the dump to be smashed to pieces and buried. But Bob had another plan for it. When my life was headed for the dump, God picked me out of the trash, restringed me through His grace, and is using me to make music for His kingdom. Dear Savior, You are my shield. You protect me from danger. So I can behold Your face! The joy of always being with You.